"We highly value the opinions of our team and clients. We knew it was time for a modernized look, but we still wanted our logo to reflect who we are as a quality-centric proven company," said CEO Remo Eyal. "At the end of the day, the logo and the site have to be pleasing to our family of clients." The company has continuously innovated online, but the logo redesign comes as a first since the original Superior Solar logo was developed over 30 years ago in 1984. The company launched its brand refresh in an effort to modernize and improve user experience, but did find it difficult to part with the look they had identified with for so many years. Remo Eyal, the CEO of Superior Solar, said that his team reviewed many logos before deciding on the new design, but sourced direct client input on everything from the logo to the usability of the site. Upon initial release to the public, Superior requested feedback from website visitors during the transition. 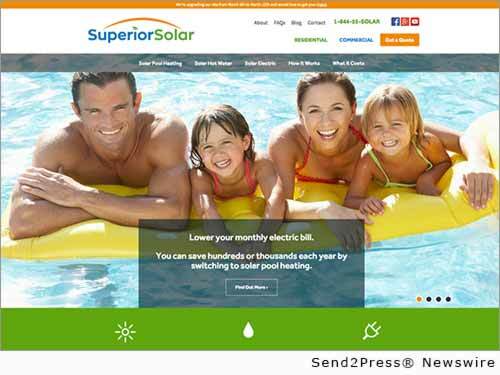 Though the website was fully launched today, Superior encourages existing customers to visit http://www.superiorsolar.com/ to review the new design and voice their opinions. Arguably, one of the biggest changes to the website was the decision to divide the site into two sections as a way to segment needs for different audiences. The site was split into a residential segment and another for commercial clients with simplified navigation and flow. Eyal said the feedback has been very positive and productive, and that his team will keep fine tuning the site to meet client needs and implement strong ideas. The Superior Solar legacy has been trusted by tens of thousands of clients since 1984. Specializing in solar electric, solar water heating and solar pool heating for residential and commercial applications, Superior Solar has grown to become the solar energy leader in Florida and the Caribbean. Our unwavering commitment to quality solar energy solutions and best-in-class service set us apart. Whether you’re harvesting solar energy for your home or your business, Superior Solar offers optimal solar solutions to ensure you’re saving green — both in the environment and in your wallet. Superior Solar was acquired by Redshift energy in 2009 and was recently combined, under common management, with TEVA Alternative Energy LLC — the parent company to Superior Solar. Visit http://www.superiorsolar.com/ to learn more. Original Keywords: TEVA Alternative Energy LLC, Remo Eyal, Redshift energy Superior Solar Orlando Florida ORLANDO, Fla.
REFERENCES: Advertising and Marketing News, TEVA Alternative Energy LLC, Remo Eyal, Redshift energy Superior Solar Orlando Florida ORLANDO, Fla.